Each October, there are certain things I can expect to see: candy corn in Aisle 12 of my local Safeway, inflatable pumpkins on neighbors' lawns (pumped full of air, most of them are now larger than the houses themselves), Vs of Canada geese arrowing across the sky, and copies of The Best American series showing up in bookstores. I'm the happy owner of four volumes in this year's collection: The Best American Travel Writing, The Best American Comics, The Best American Non-Required Reading and The Best American Short Stories. 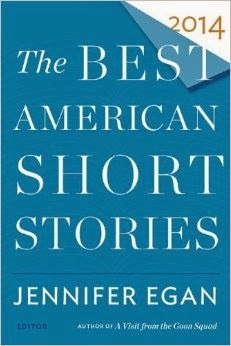 Today, I thought I'd take a moment to highlight the latter, edited by Jennifer Egan. Though I've had a love/hate relationship with the annual anthology in the past (some years the stories, frankly, have been dry as dust), the 2014 collection looks especially good, as tasty as a Candy Corn Cappuccino from Starbucks. * Due to a shortage of reading time last month, I haven't had a chance to actually read all the stories, but I've taken sips here and there--enough to know that this year's Best truly features some of the best short fiction published in periodicals between January 2013 and January 2014. Much applause should go to series editor Heidi Pitlor who winnowed the contents of 208 publications to 120 stories, 20 of which were then chosen by Egan. Pitlor kicks things off with a thoughtful Foreword, in which she says, "This year, I detected a certain uncertainty in short stories, a sense of disorientation, perhaps a reflection of these unsteady times for publishing and readers. A lot of story writers relied on a character's intuition or impulse to fuel the forward motion of their stories. As a result, man stories tended to wander--sometimes intriguingly, often into unsettling territory--rather than accelerate toward some definitive endpoint." I include these words at the risk that I'll lose those of you who are fence-sitters when it comes to short stories. In the years of writing this blog, I've encountered many otherwise good-hearted and level-headed people who take an uncharacteristically hostile stance toward short fiction, often citing the very meandering, open-ended qualities Pitlor just mentioned. I do hope those wafflers give this collection (and, indeed, one of the dozens of other short story collections published this year) another whirl. For her part, Egan said she selected the final 20 "best" stories based on criteria such as "a compelling premise and distinctive language." Her other standard was this: "In each of the twenty stories I chose--even those set in the past--I felt an engagement with the wider world at this specific point in time." The stories range from the year 1399 ("La Pulchra Nota" by Molly McNett) to our present day and the war in Afghanistan ("Kattekoppen" by Navy veteran Will Mackin). There are stories about an alcoholic musician ("A Hand Reached Down to Guide Me" by David Gates) and one about the rise and fall of an early-1990s indie rocker told through artifacts ("This Is Not a Love Song" by Brendan Matthews). There's even a story narrated by "Madame Bovary's Greyhound" (Karen Russell). Jude was born in a cracker-style house at the edge of a swamp that boiled with unnamed species of reptiles. The Soros Sisters' eyes are the blue of lunar seas, their complexions cloud white, and their identical pageboys well-bottom black. They took walks to the beech grove at Banneville, near the abandoned pavilion. Foxglove and gillyflowers, beige lichen growing in one thick, crawling curtain around the socketed windows. Moths blinked wings at them, crescents of blue and red and tiger-yellow, like eyes caught in a net. In Antarctica there was nothing to identify because there was nothing left. The Brazilian station at the tip of the Antarctic Peninsula had burned to the ground. All that remained of my brother was a stainless steel watch. What we were arguing about that night—and it was late, very late, 3:10 A.M. by my watch—was something that had happened nearly twelve hours earlier. A small thing, really, but by this time it had grown out of all proportion and poisoned everything we said, as if we didn’t have enough problems already. Mallory was relentless. And I was feeling defensive and maybe more than a little paranoid. We were both drunk. Or, if not drunk, at least loosened up by what we’d consumed at Chris Wright’s place in the wake of the incident and then at dinner after and the bar after that. I could smell the nighttime stink of the river. I looked up and watched the sky expand overhead and then shrink down to fit me like a safety helmet. A truck went blatting by on the interstate, and then it was silent, but for the mosquitoes singing their blood song, while the rest of the insect world screeched either in protest or accord, I couldn’t tell which, thrumming and thrumming, until the night felt as if it were going to burst open and leave us shattered in the grass. Friends, there's a lot to love in these pages. I ditto and square it. *Not that such a thing exists....but it should!